Q: According to reports, Vice President of the European Commission Andrus Ansip said that the EU has to be worried about Huawei and other Chinese companies. The Chinese government may require Chinese technology companies to cooperate with Chinese intelligence services, such as on "mandatory back doors" to allow access to encrypted data. What's your reaction? A: We have noted that recently, some people in certain countries have been saying that Huawei "may" pose threats to their national security, but none of them have yet to produce any convincing evidence on how their national security has been affected by Huawei. It is very ridiculous to obstruct normal operations of businesses just because of some "speculations". In addition, I don't think this is conducive to mutually beneficial cooperation between countries in a globalized world. In fact, I would like to know how they would feel if their countries' products or investment and cooperation are put under restriction simple because of groundless accusations like these. How would they think about that? Huawei is an independent Chinese private enterprise which has forged good cooperative ties with many countries around the globe, and we haven't heard of any of them having security problems because of their cooperation with Huawei. As far as I know, Huawei has signed 5G commercial contracts with companies in over twenty countries, which proves that it has won full recognition. I would like to stress again that Chinese laws and regulations never give any institution the mandate to force companies to build "mandatory back doors". The Chinese government always encourages Chinese enterprises to follow international rules and abide by local laws when conducting economic cooperation with other countries. We also hope that relevant countries can provide a fair, transparent and unbiased environment for Chinese enterprises seeking investment, operation and cooperation there and refrain from setting up unnecessary obstacles for the normal operation of Chinese businesses out of other motives. Q: There is a lot of public anger in China against Canada about the arrest of the Huawei senior official. The Foreign Ministry said on Saturday when you summoned the Canadian Ambassador that if Canada does not immediately release Meng Wanzhou, then Canada will have to pay the consequences for it. So, can you tell us how will China retaliate against Canada or the United States to satisfy the public anger? A: China's position is already very clear regarding what happened on December 1. 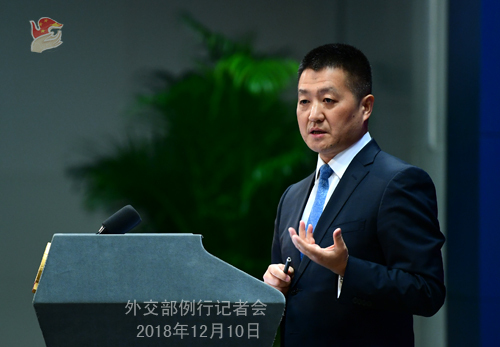 Vice Foreign Minister Le Yucheng summoned Canadian and US Ambassadors to China subsequently over the weekend to state China's solemn positions. We hope that the governments of these two countries can treat this seriously. Like you asked, Vice Foreign Minister Le Yucheng pointed out to the Canadian Ambassador that there will be severe consequences if Canada fails to handle this matter correctly. If you want to know what these severe consequences are, I can tell you that they wholly depend on the Canadian side. Q: In a bid to prevent cyber attacks and ensure cyber security, the Japanese government on December 10 rolled out relevant new rules on government procurement. Some media reports say that Japan is actually excluding Huawei and ZTE from government purchase list in collaboration with the US. What's your comment? A: We have noted that the Japanese government unveiled new rules related to government procurement today, prior to which the Chinese side already communicated with the Japanese side on this matter. Japanese Chief Cabinet Secretary Yoshihide Suga said when taking questions from journalists that the introduction of relevant rules does not aim to exclude particular enterprises and equipment. What I need to stress is that Chinese enterprises' investment and cooperation in Japan is for mutual benefit and win-win outcomes in essence. The Chinese side always encourages Chinese enterprises to observe market principles and international rules as well as local laws in their local investment and cooperation activities. Meanwhile, we have been asking the Japanese side to provide a fair, transparent and non-discriminatory environment for Chinese businesses operating in Japan. China will keep closely following the implementation of relevant rules by Japan. What matters is that the normal business activities of Chinese enterprises in Japan should not be subject to any discriminatory treatment. Q: Canada's Deputy Foreign Minister Ian Shugart was due to arrive in Beijing yesterday or today, but that trip has been postponed reportedly. Are you aware of any meeting plans with Chinese officials and if so, why are those meetings postponed? A: I am not aware of the relevant situation. We always believe that all countries could conduct exchanges and cooperation on the basis of mutual respect, equality and mutual benefit. Q: There was a provincial forestry delegation from the Canadian Province of British Colombia that was scheduled to visit China this week. The Forestry Minister from the Province of British Colombia canceled that trip over what is happening with Huawei. What is your message to the Canadian businesses who may be concerned about coming to China in the wake of this dispute? A: As for why the Province of British Columbia has canceled or postponed the China leg of its mission, you can only ask the Canadian side for an explanation or clarification. As for your question, I can assure you that the Chinese side will always abide by law in what we do. Q: You just said that companies of many countries have signed cooperation documents with Huawei. Who are they specifically? A: I just said that over 20 countries have signed 5G commercial contracts with Huawei. As for who they are specifically, I can look them up for you. In fact, many more countries consider Huawei as a reliable partner for cooperation. You may have noticed that last week, Portuguese enterprises signed cooperation agreements with Huawei. At the sixth China-France High-Level Economic and Financial Dialogue last week, French Finance Minister Bruno Le Maire told journalists in Paris that Huawei is an important company for France and France welcomes Huawei's investment. Not long ago, German government officials also said that the German government is not planning to ban foreign suppliers from supplying 5G equipment. German telecom companies are cooperating with many others including Huawei on the development of 5G networks. These examples are enough to prove that Huawei, along its way of growing up, has earned trust from its partners around the world. Q: A 14-day joint military exercise is going to take place in Chengdu between India and China. This comes after a year-long gap because of the Dong Lang issue between India and China. Do you have any comment on that? A: To put it simply, we wish to see good outcomes. We all know that since President Xi Jinping and Prime Minister Modi met in Wuhan, the two sides have reached important consensus on promoting bilateral exchanges and cooperation and properly managing differences on the basis of mutual respect and mutual trust. In fact, President Xi Jinping has met with Prime Minister Modi four times this year. Departments on the two sides in charge of various fields are making positive efforts to more effectively implement the consensus reached between the two state leaders. Contacts between the two militaries and border troops are part of these efforts. We believe that under the guidance of the consensus between the two state leaders, the two sides will make joint efforts to ensure that bilateral exchanges and cooperation, including those in the defense field, will achieve positive outcomes and offer more driving force for the development of bilateral relations. Q: Today is the Human Rights Day. We all know that many developing countries differ a lot with the western countries in the field of human rights. How does China approach the international cooperation in this field? A: Promoting and protecting human rights is the shared aspiration of all mankind. Every country should seek to improve its human rights cause. As the world celebrates the Human Rights Day, the international community should recommit to enhancing human rights guarantees, promoting human rights exchanges and resolving relevant disputes through dialogue and cooperation in accordance with the purposes and principles of the UN Charter. 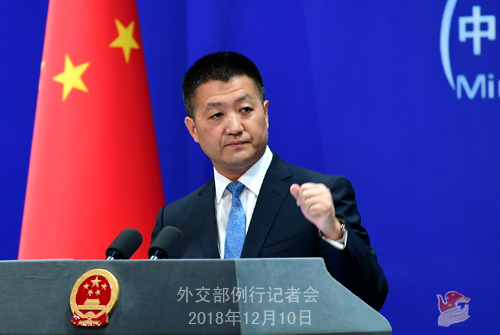 Like many other developing countries, China consistently opposes politicizing and adopting selective and double standards on human rights issues. On the basis of equality and mutual respect, China stands ready to step up exchanges and cooperation in the field of human rights so as to realize mutual learning and common progress. Q: Will China send a delegation to the US for the trade talks? If so, who will lead it? A: You may have noticed that the Spokesperson for China's Commerce Ministry has made it very clear last week on how the two sides, under the consensus reached by the two state leaders, will continue to pursue economic and trade talks. I can tell you that the economic teams on the two sides are stepping up contacts and consultations. We hope that our two sides could work together to earnestly implement the consensus reached by the two leaders in Buenos Aires. As for the details, you could keep in touch with the Commerce Ministry. Q: Can you help explain for people in Canada in particular, what is meant by the term "severe consequences"? A: I already made it clear enough. The consequences they face totally depend on what they choose to do. Q: How many passports does Ms. Meng have? How many passports from different countries are Chinese citizens allowed to have? A: I have noticed that there have been some speculations in the media on this issue. My colleague last week said unequivocally that according to the Nationality Law of the People's Republic of China (PRC), Ms. Meng Wanzhou is a national of the PRC. If I may add, the Canadian side also admitted in its first court hearing that Ms. Meng Wanzhou is a Chinese national. I want to remind everyone that considering confirmation from both China and Canada that Ms. Meng Wanzhou is a Chinese national, such online speculations that say otherwise are meaningless, because they are not core and fundamental to the matter we are facing now. Q: The Chinese government said that Meng Wanzhou's human rights have been breached. Which of her human rights have been breached? A: China has a consular agreement with Canada. In accordance with this bilateral consular agreement, the Canadian side should inform the Chinese diplomatic missions in Canada immediately of its unreasonable detention of Ms. Meng Wanzhou. To our regret, it was not the case. Some media reports have disclosed that during detention, the Canadian side was far from ensuring necessary medical care for Ms. Meng Wanzhou. We believe that this is inhumane and constitutes a violation of her human rights. Q: Can you tell us exactly when China was notified that she was arrested? A: This question has been raised many times last week and answered by my colleague many times. We lodged stern representations with the Canadian side as soon as we learned about the relevant information. 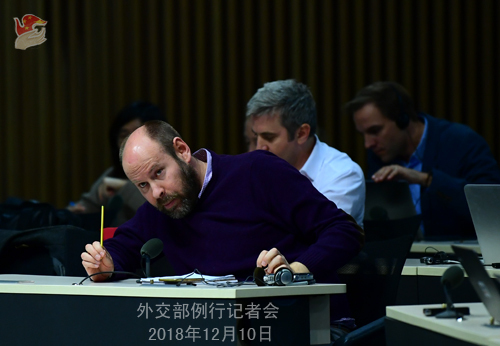 Q: How many times has the Canadian Ambassador been summoned to the Foreign Ministry over the case of Meng Wanzhou? A: I can tell you that in Beijing, the Chinese government lodged representations with the Canadian side as soon as it learned about this matter. And also, in Canada, the Chinese Embassy made representations with the Canadian government, and not just for once. Q: Are you saying that the Chinese government found about her detention indirectly, that is it was not via the Canadian or the US authorities, it was via the media or something like that? A: According to the consular agreement between the two sides, the Canadian government should inform the Chinese diplomatic missions in Canada at the earliest time possible of its detention of a Chinese citizen for whatever reasons. But the Canadian government failed to do that.